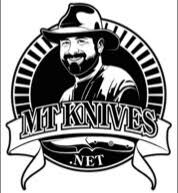 Patrick Roehrman over at MT Knives has just released an e-book on Sharpening Knives. Right now it is free if you buy his Beyond Razor Sharp video. I got the video when he did his Kickstarter campaign to fund it. While I have not taken full advantage of everything the video has to offer, it has helped me. It is the kind of thing you need to watch several times and practice what was demonstrated and is definitely worth the price of the video.